From this starting point an entire field of animal movement modelling emerged. Matching these models to reality was spectacularly achieved in 2008 by a group in Italy who were able to film starling murmurations around the rail station in Rome, reconstruct their positions in 3D, and show the rules that were being used. What they found was that starlings sought to match the direction and speed of the nearest seven or so neighbours, rather than responding to the movements of all of the nearby birds around them. 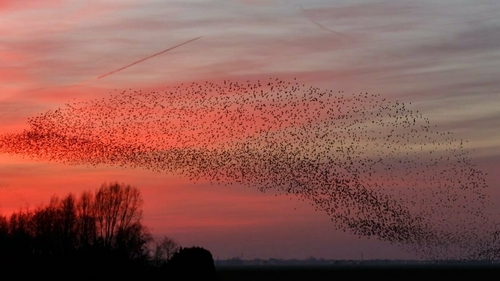 When we watch a murmuration pulsate in waves and swirl into arrays of shapes it often appears as if there are areas where birds slow, and become thickly packed in, or where they speed up and spread wider apart. In fact this is largely thanks to an optical illusion created by the 3D flock being projected onto our 2D view of the world, and scientific models suggest that the birds fly at a steady speed.